Storm Power Components offers unmatched dedication to the fabrication of copper bus bar. Copper is a unique metal with several key variables often overlooked by manufacturers, like alloy characteristics, energy efficiency and electrical consideration such as resistance, heat loss and optimal use of surface area. To meet these demands Storm employs CNC fabrication, copper sourcing, electroplating and testing. And by consolidating all aspects of copper bus bar manufacturing Under One Roof, Storm cuts lead time and outsourcing costs. Storm's Expert Engineering and Design Support staff can also assist you in the fabrication of other custom busbar options such as Laminated Bus Bar, Busbar Insulations, Inverter Bus Bar, IGBT Bus Bar, Power Distribution Bus Bar, Backplane Bus Bar, Circuit Breaker Bus Bar, and Multilayer Bus Bar. This is where Storm's engineering and design support also steps in. For example, copper busbar systems for industrial and commercial facilities are often designed to minimize first costs, with the bus bar sized to the minimum permitted by safety considerations. In such cases, operating costs are ignored at the design stage and, as a result, large amounts of electrical energy are wasted in service due to heat loss. Here Storm's designers may recommend using larger cross-sections of busbar thatresult in more efficient systems with lower operating costs. The result is an optimal system that properly balances first costs with operating costs in order to minimize total life-cycle cost. When combined with Storm's Value Engineering, our full in-house CNC Capability saves even more time. 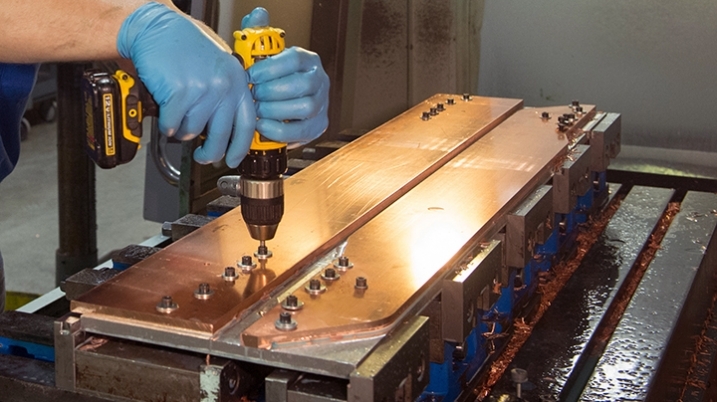 Virtually all of Storm' electrical busbar business involves copper and a variety of core metalworking capabilities, all based on CNC technology. Storm's equipment includes shear, presses, press breaks, water jet and punching machines, to produce materials, processes, and finished components engineered to meet standards required by ISO 9001, ASTM, UL, CSA, Bellcore, and other testing/standards bodies. Plus, Storm's prototyping capability can put samples of busbar connectors in your hands for evaluation in a matter of days. Storm's In-house electroplating streamlines busbar production even more by eliminating the time and cost of outsourcing. Storm offers in-house copper bus bar bright and matte tin, lead, tin/lead alloys, nickel and silver using rack & barrel plating electroplating. This capability is proven to reduce lead times critical to OEMs. Not only is internal electroplating is more cost effective than outsourcing, plating in house offers a green component to manufacturing by eliminating fuel consumption and pollution from transport from plant to plant. Strike Plating — an ultra-thin coat of nickel, tin or other material that is applied before the final exterior plating finish.